One Source Equipment Rentals has Dri Eaz Sahara Pro X3 turbo dryers, sometimes called carpet dryers for rent or sale. 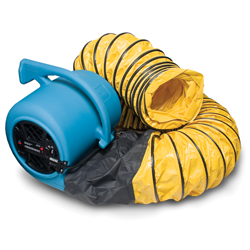 These high volume fans are designed to be used in conjunction with dehumidifiers to aid in the drying out of floors and walls that have been damaged by water. Applications include: water damage, restoration, remediation.